The Massachusetts Institute of Technology, more famously known as MIT, is considered to be one of the best universities, producing some of the best minds in engineering and technology in the world. 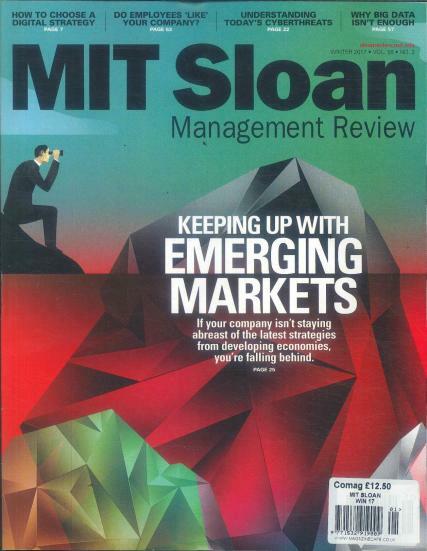 Buy a single copy or subscription to MIT SLOAN magazine. As part of this university, MIT Sloan School of Management is also considered to be one of the leading business schools in the world as well. Therefore, MIT Sloan magazine is also considered to be one of the best business and management publications that captures this academic spirit and presents incredibly captivating information regarding the business and management world today. For all of your business and management inquiries, curiosities, and the latest news in this field, MIT Sloan magazine is certainly the best magazine on the market. This magazine truly gives you the best management reviews from the leading minds and thinkers who can only be a part of the MIT Sloan School of Management. Each issue also features the best ways that you can get yourself into the workforce and make the most of your career using your own set of skills and values. No matter what field you study in, you will still need to find a job, and therefore this publication is considered to be the best resource for all of your questions and curiosities regarding the employment market and how to use your skills to find the perfect job.